I've read over the eye page and done a lot of searching through the forum, but unfortunately a lot of photos are missing from the older threads so I'm still at a little concerned. I'm really looking to rule out it being anything other than blindness, like cataracts, as I know blindness on one side isn't too much of a concern for a piggie. Purdie's left eye is the one reflecting in a way I know to be a potential sign of blindness. 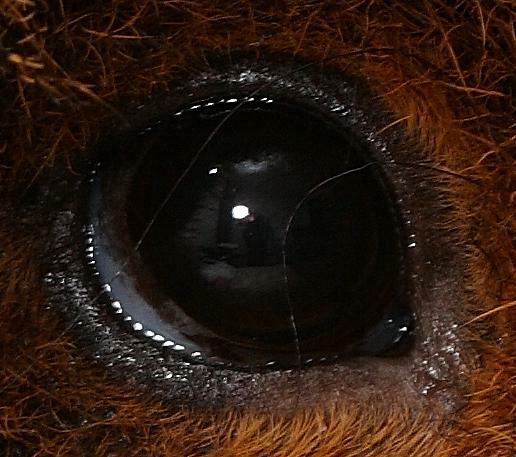 Super duper close up of left eye. Super duper close up of right eye. Purdie is around 1 year 5 months old, she is a Merino pig (coronet x texel) and was rescued from a breeder that got in over their head. She came to us known as an unsociable pig who had never been successfully paired with a friend. For some reason with us she settled straight in and was desperate to join the herd and she absolutely loves living in our pen. We have always wondered how good her sight is as she is quite jumpy around the other girls and ourselves sometimes. She seems to overreact a lot in some situations where the other girls would know there was nothing to worry about. She still screams whenever she is lifted out of the pen even though she loves her cuddles. I do not remember her left eye ever being so obviously abnormal, but that may be because her hair was always so much longer before now. The camera shows up the silver sheen but even looking at her under daylight or artificial light it is very obvious. I have tried testing her sight but while I can say with almost certainty she can see out her right eye just fine, she doesn't play ball with any of my tests! I've tried my fingers, a light... 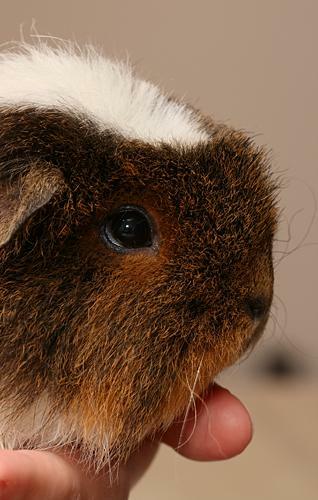 I think guinea pigs just aren't interested in anything without a smell, and of course using veggies would defeat the purpose of the test! Is she evidencing any sign of pain? Go into a dark room. Shine a flashlight into her eyes. If her pupil doesn't react, she's blind. Have you had a vet check her eyes? Her pupil definitely contracted :/ We'll make an appointment asap to get her eye stained. I feel horrible, I have no idea how long it has been like that. She isn't showing any signs of pain at all, or at least nothing out of the ordinary for her. But if she's had this since we got her (I really can't be sure) then no wonder :/ She's never had it checked at the vets, it's only since we started trimming her hair around her eyes to help her vision that we've noticed it. Could it be a cataract at all? It could be a cataract, and if this is the case you might consider getting her tested for diabetes since she's so young. Cataracts are very common in older pigs, though. I think what I'll do is take her along with Brie when we go to see our good guinea pig vet. We're getting Brie checked for cysts so Purdie can hitch a ride at the same time. If it turns out we can't get through to see him until next week then I'll take Purdie in sooner to see the local vet I like as well. If it is a cataract I will definitely get her tested for diabetes. Don't feel horrible. If she's not evidencing pain, my best guess would be a cataract, which are not at all uncommon. They can get glaucoma and some form of lens slippage (?? IIRC) that is extremely painful. I suspect if she had either of those, you'd know. In my *very* limited experience, the fancy coated pigs tend to develop more problems, not surprisingly, and develop them sooner. Do have her blood sugar tested (should be a simple and inexpensive test, at least to start with), but don't beat yourself up in the meantime. Looking at the left SDCU photo, my gut hunch is cataract. It looks like the slipped-lens pictures I've seen, but those are painful; really painful to the point where her behavior would so indicate. Thanks Talishan, I'm really hoping she isn't in pain. She absolutely loves having the top of her head rubbed and her chinnies which would seem to indicate she doesn't have pain in her head I would have thought. Do you think an eye stain would be a good move to rule out any surface damage? See what the vet says, but I think so. Unless the vet is convinced there's no surface damage and the stain would be useless, I'd have it done. They're not that expensive, not that painful (more annoying than anything else to the pig; they don't like them but I don't think they really hurt), and quite definitive if done correctly. My old vets would put a drop of something that ends in -caine into the eye first, so the stain stuff was less irritating. That was a while back; the stain stuff may now even have it in it, but ask. I'll get one done sooner rather than later then if we can't get to the super vet this week. There's a local vet I trust with that kind of thing, she was wonderful with Gracie's eye problem a while back. Thanks again Talishan, I should be able to get a good nights sleep now :) Why these things always happen in the middle of the night I have no idea! My guess also is a cataract. Would you like me to add your great pics to the thread? As you can tell looking at old threads, the pics do sometimes disappear. I try to save the most illustrative ones. Purdie is so pretty in her close-up photos! I noticed that my Ginny had a cataract in her left eye too, just over a year ago. It was quite like you described - just one day, it seemed to appear. The vet told me that she also has one in her right eye as well, but it does not seem as "eye-catching" as the left one. She had blood tests and urine tests for diabetes, and now I keep her on a very restricted diet. After a year, she still has some vision in both eyes. Ginny's eye in those pictures looks a lot like Purdie's, I think it's pretty certain to be a cataract from reading your thread and one linked from it. I do wonder about her other eye as it was quite hard to see her pupil contracting in the right eye when we shone the light in. I think I'll take her to our local vets for tests as she's probably going to need more than one lot done if it turns out she is diabetic and our good vet is too far away for weekly visits. I'll still take her with Brie though so that he can have a good look at her. I'm reading over the diabetes info linked from the main site here and I'll start searching through the forum as well. I know at least Purdie hasn't had any other health problems. The only things that really stand out with her is her sensitive skin (no doubt due to being texel) and her small size. She doesn't lose weight but she's never really gained any either and she is tiny (2lb 2-3oz, 970-1000g) compared to my other girls, who are all admittedly quite large. Edit: I meant to say as well that at the moment there are no other signs of anything wrong. She isn't peeing or drinking excessively or displaying any of the other diabetes symptoms, she isn't lethargic or displaying any heart piggie signs either. Hopefully if there is something underlying this means it's in the early stages *I hope*. I'll ask good vet if he can x-ray her without sedation as well (local vets won't) just to see everything is good inside. The only other thing is that you can see with her right eye up above that the eyelid does jut out a little from her eye exposing the sort of fatty white looking stuff. It's always been like that. Thanks, I'll go add them. Purdie has been confirmed as having a cataract in her left eye, and the vet also showed us that her sight is in fact even poorer in her right eye than it is in the left. 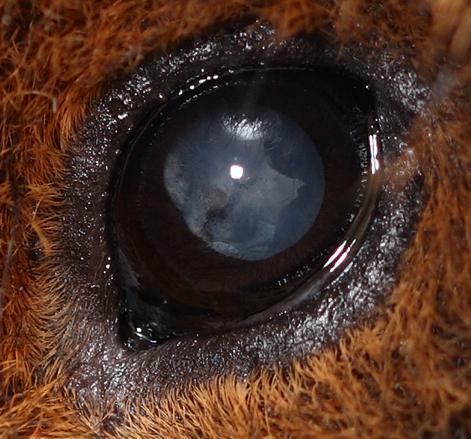 Her right pupil is incredibly slow to react to light, which points to it being a congenital problem. Purdie also provided the vet with her Lake Piddle which he was able to test with a couple of different strips, one specially for testing glucose levels. Both came back normal, and her physical exam showed nothing out of the ordinary. I'm quite happy with that as like I say she is showing no other symptoms of anything wrong. The vet did say that it may be that she will develop cataracts in her left eye as well. I feel so sorry for the poor darling, but at least now I know why she can be so jumpy and perhaps why previously she had never managed to live with another pig before. I am glad that at least she is happy living in our pen with the girls, even if her sight is deteriorating. We will keep a close watch and when the time comes we will simply keep enough things in the same position that she feels happy. We will also keep a close watch on her eyes to make sure nothing further develops. 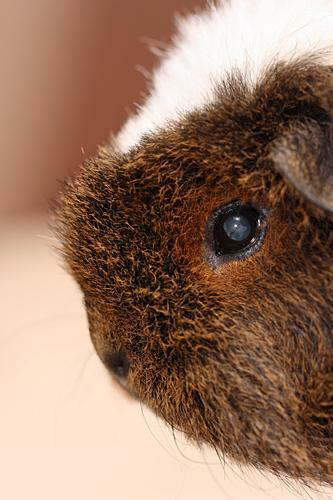 There are many threads about caring for blind (and partially blind) guinea pigs, as I'm sure you have seen. One thing I do for Ginny is to always keep things in her cage and her floor-time area the same. This way she always knows where her food dishes and water bottles should be. That is good news indeed! I second tracis is this is how I handle Lady Bug's blindness. I also speak to her when I enter the room and before I pick her up. Helps keep her from becoming startled. With that said, I am glad that they ruled out diabetes for your pretty girl. We're going to start keeping some things in the same place and see how it goes, she's never had a problem bumping into houses or anything so far, it tends to be the other pigs she bumps into! But if her eyesight continues to deteriorate we will start keeping solid houses and bowls, racks, bottles and so on in the same place.